Where to Put the Anger and the Pain? And Once Again We Must "Deal with It"
What Does Integrity Look Like Five Years Later? 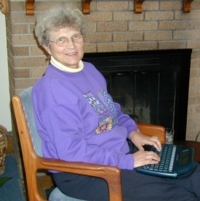 Re-Defining and Re-Claiming "Feeling Like A Jerk"
The Marathon of "Keep on Keeping On"
The Toll of Never Being "Cured"
Marlene Hoerle using her AlphaSmart keyboard. Clamoring is exactly the right word. Your body is so actively loud it preoccupies you relentlessly. It is such a dilemma for many reasons. If we aren't attentive to its needs it only gets louder, if we are attentive to its needs it stays loud. Rarely is your body peaceful. Rarely is it comfortable. Rarely is it unnoticeable. No wonder we struggle with the body soul connection. I contend that the integrity of the system dictates that the spirit informs the body and the body informs the spirit, in that order. A clamoring body defies that sequence and even attempts to abort it. I never in my wildest dreams expected that one of the most devastating outcomes of traumatic brain injury would be a clamoring body. Obviously, nerve damage has interfered with every pathway that messages usually travel on with ease. Sometimes it seems as if every way station is damaged and every network is scrambled. Rhythm and smoothness are no longer your birthright where electrical currents within are concerned. Static and chaos prevail. So how do we compensate for this disturbing reality? There's nothing we haven't tried. You are diligent in your perseverance of exercises, Tai Chi, Yoga, music, baths, reading the musings and TV. We are left to confront this reality head on. NOTHING is going to really relieve it enough to allow you to have bodily comfort and peace. As harsh as this sounds, it is the harsh reality. So, back to the purpose of this musing, how to keep a spiritual connection vigorous and fulfilling in light of this harsh reality. First, declare an end to trying to achieve bodily comfort and peace. Instead, continue to do whatever works to keep the clamor form escalating and to achieve some semblance of comfort. But, and this is a big "BUT", reorient your focus. Image your inner world of the spirit and make your home there. Create a spiritual tent where intimacy with your love of beauty, your love of birds, your love of flowers, your love of music, your love of history, your love of comedy, your love of dance, your love of integrity, your love of intelligence, you love of those you love, permeates the air,and of course your love of liberation psychology. How rich you are. How deep you are. How able you are to be immersed in your spiritual connection to yourself and to life. Indeed the dilemma really isn't in "keeping a spiritual connection", it is in EMANATING from it. It is your place of origin. Live there. Begin and end there. Your body must become secondary, not it importance, but in sequence. Not only are you not defined by herpes simplex encephalitis and all the havoc it has wrought, you are not confined by it, either. The spirit cannot be confined by the body. It can travel anywhere, "anywhere in its mind." You are being asked, no demanded, to become more vested in the already rich spiritual connection you already have. For every twitch, for every pain, for every clamoring need your body has, travel within and absorb the aura of your love of spiritual intimacy. It is, perhaps, not louder, but its deeper and it's richer, and definitely more treasured. In your tale I have the line "Everything is inside you, the magic's in our eye"...and "We look in instead of out and knowing, really knowing, what life is all about" Well as always, you are challenged to live out of every last concept of that tale. Read and reread the ending of "Her Tears" It is where you must live and will allow you to be aware of your spiritual richness as well as your clamoring body. Then and only then, will we restore the integrity of your system - spirit will inform you body prior to body informing your spirit. Rich will stand beside suffering and awe will join hands with hard. Copyright © 1999-2012 Liberation Psychology. All rights reserved worldwide. The resources at this web site are copyrighted by the authors and/or publisher and may be used for non-commercial purposes only. They may not be redistributed for commercial purposes without the express written consent of Michele Toomey. Appropriate credit should be given to these resources if they are reproduced in any form.